Somehow I always have a list of things to paint. The siren call of a cheap furniture makeover never fails to seduce me. The dining room table has been on this list forever, but until recently I couldn’t decide how to paint it. I bought it more than 15 years ago from a friend of a friend for $100. She had bought it from a consignment store. It’s a large rectangular table, but with unusual angled corners. It also came with three leaves and a complete set of custom table pads. Since we regularly host family and friends for dinner, we love its flexible size, and a new table of comparable dimensions isn’t really in the budget. But the finish on the table has seen better days, and some of the veneer on the apron is cracked, peeling, or just plain gone. 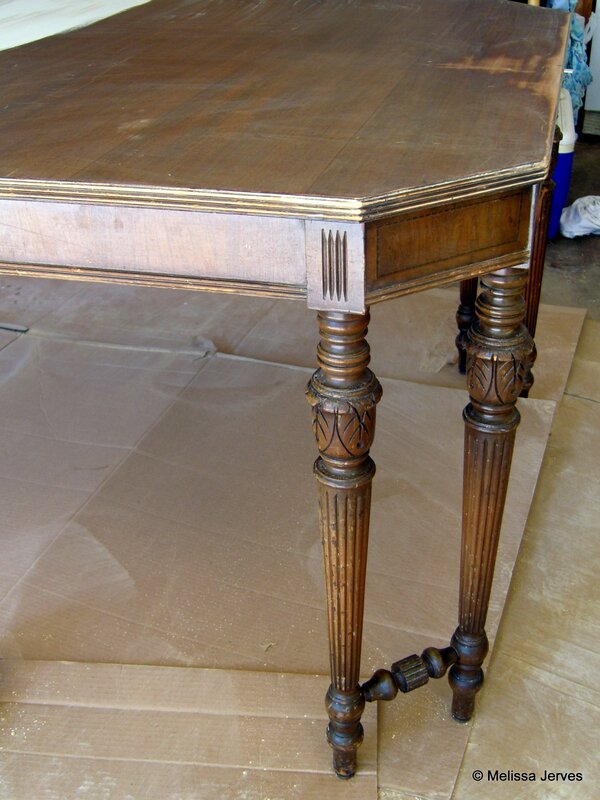 I finally decided this table might look good with a creamy antiqued finish, similar to the Swedish antique style. 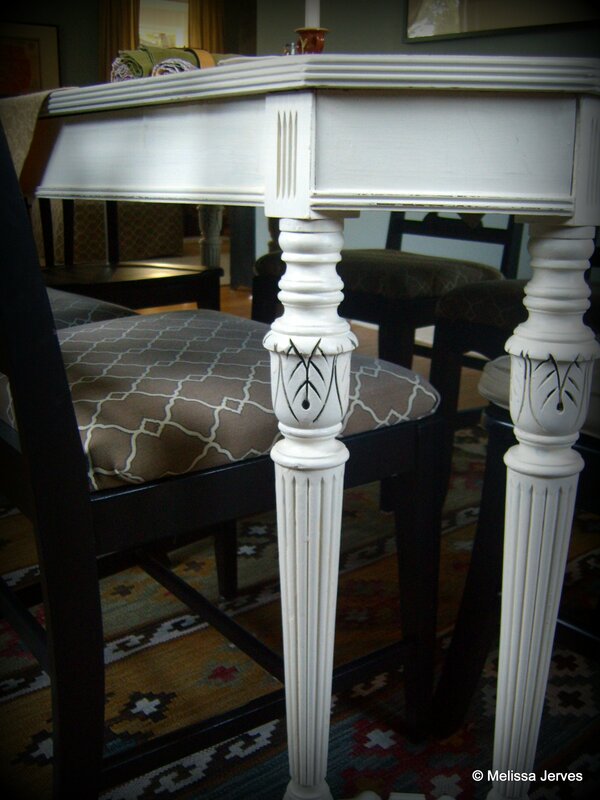 I’d also read all sorts of raves about Annie Sloan Chalk Paint, and how easy it to use on furniture. No priming! But at $30-something a quart, it felt too expensive. And then I came across a homemade formula for chalk paint. The results looked good, so I decided to give it a try. I already had paint, and only had to buy plaster of Paris, which was less than $7 at Home Depot. I’m really happy with how the table turned out. It only took two coats of the homemade chalk paint to cover, and then I sanded the edges of the table just a little, so the original wood finish would peek through. 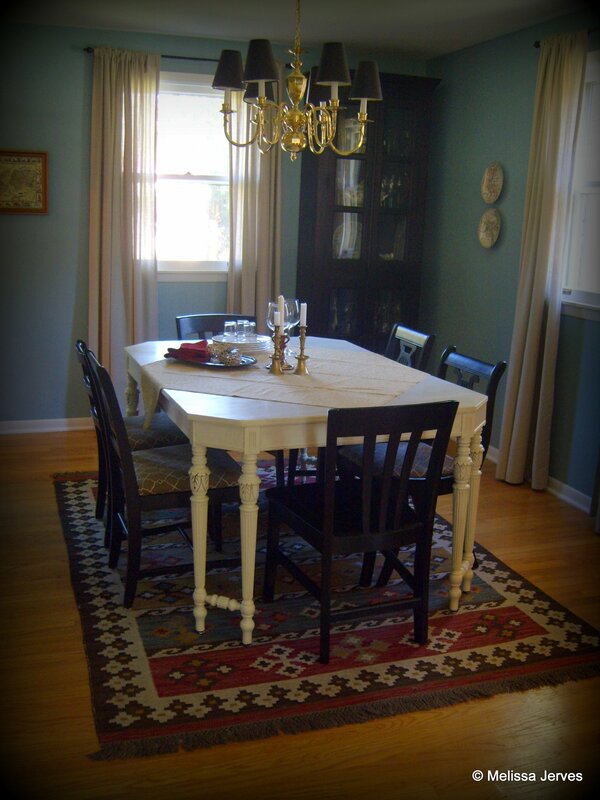 After a coat of natural paste wax (two coats on the table top), we brought the table back in the house. I think the new color lightens up the room, and I definitely appreciate not having to cover the ugly scratched finish with a tablecloth (have you seen what a four-year-old can do to a tablecloth in a single meal?). I’ve crossed this item off the list, but the list isn’t any shorter. The day after I finished it, I found a wicker chair on the curb, just waiting for a little love and spray paint. That is one beautiful table! I love that you made your own paint! I can’t wait to finish clearing out/organizing our house so I can get to work on the DIY stuff!